Just 22 miles from historic downtown Charleston, Marshhound Farm is a picturesque, waterfront horse farm estate on nearly 12 acres. 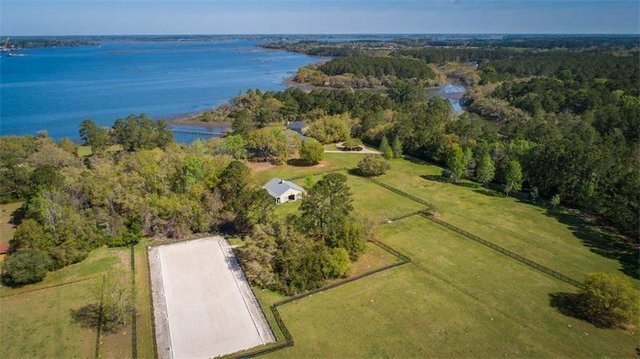 This stunning waterfront home and equestrian facility is situated within Martins Point Plantation, a private 900 acre community on Wadmalaw, a barrier island retreat cherished by generations of Charlestonians for its privacy, natural beauty, and ease of access to the city. Despite the proximity to town, you'll feel miles away as you pass through a private gated entrance leading you down a private drive that reveals an exquisite elevated home with a circular driveway, surrounded by a canopy of stunning oaks. This 4,850 SQFT custom home is as perfect for entertaining and holidays as it is for everyday enjoyment. There are countless thoughtful features including heart pine floors, four fireplaces, a downstairs master bedroom, abundant storage, a large media room with an outdoor balcony, gourmet kitchen, mud room, and a relaxing screened-in porch. The views of the water throughout the home are absolutely breathtaking. Just yards from your residence, the four-stall custom barn with conditioned tack room and full bath provides comfortable accommodations for your horses. Additional equestrian amenities include a paddock, riding arena, and wash stall. From the house, you are also just steps from a private dock. At high tide, enjoy 8+/- feet of water by taking out your kayak or Jon boat, trying your hand at fly fishing for red drum or crabbing, a Lowcountry favorite. At any tide, enjoy relaxing, appreciate the sights, sounds, and wildlife of the ever-changing marsh ecosystem, and take in the serenity that surrounds you. Martins Point Plantation amenities include a private boat landing and boat storage area, allowing you access to deep water on the Intracoastal Waterway. If you are in search of a elegant, private, and tranquil Lowcountry equine property, this one of a kind property is it.